Yesterday, I drew the 7 of Swords. When I did, I mentioned that I’d drawn it in a reading that T had helped me with over the weekend. 7 of Swords showed up in the higher power position, meaning that my strongest energies right now are coming from fear/anger that someone is taking something from me, or has taken something from me. With it, I drew the Beauty fairy oracle… and that found me fighting tears. I wrote it out in yesterday’s thoughts that I have lost my own sense of beauty and self worth based on past pains and failed relationships. I felt I’d been robbed of my own worth. And so today, following up that seven of swords drawn yesterday, Beauty makes yet another appearance to drive the message home. 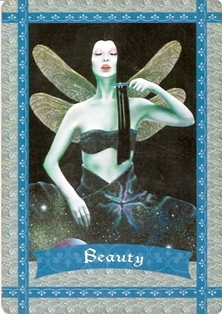 Card Meaning: Appreciate and amplify your natural attractiveness. Your beauty is most apparent when you’re happy and satisfied. Description: We are all attractive in our own unique way. Part of self-esteem is appreciating how wonderful you truly are. Never, ever put yourself down in any way! Always think self-loving thoughts about your body, your face, your hair, your weight, and every inch of your physical self. Tell yourself positive affirmations daily, such as, “My inner light radiates through every pore and cell of my body, and everyone is attracted to my inner and outer beauty.” Invest time and money in services that make you feel wonderful, such as massages, facials, manicures and pedicures, soaking in a tub, or getting a new hairstyle. Spend time in meaningful ways that make you feel joyous, and you will glow with the attractiveness of a truly happy person. Affirmation: My inner and outer selves are radiantly attractive right now. I love my beautiful self.